1. 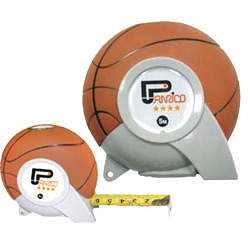 Sports series measuring tape. 2. With automatic stopper; ergonomic retrieve device set at bottom. 3. Delicate design in sporting ball shape. 5. Quality ABS & TPR composite case. 6. Metric, SAE and Metric/SAE measuring are all available. 7. Standing double blister packing.